Well friends… now that we seem to be on a maxi kick (did you catch yesterday’s post?!) I thought I’d share another angle-length beauty I’m loving! 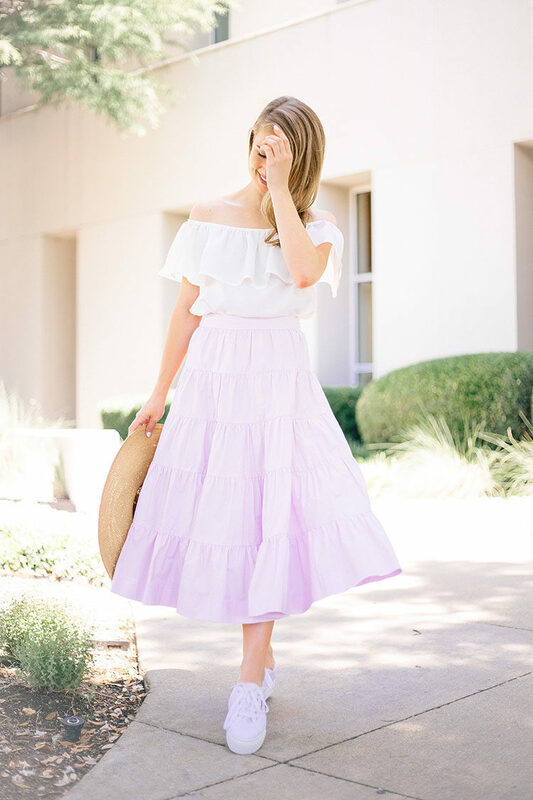 A round of applause, if you will, for J.Crew’s lovely, lilac maxi skirt! It’s something utterly romantic and definitely different from my comfort zone, and I love it. The gorgeous, soft summery hue, the fitted waist and tiered silhouette… all of it! Another departure from my comfort zone? These platform sneakers that I’ve been wearing all over Europe the past couple of weeks! They’re just funky enough to add a fun spark to any ensemble, while simple and discreet enough to blend in with anything! I’ve paired them with everything from sundresses to jean shorts lately, and couldn’t love them more. Before I sign off in search of another crepe, I thought I’d invite you to join my weekly newsletter! I know many of you already have, but if you haven’t yet…. here’s where you can go to get exclusive content meant to bring a little happiness into your week. Enjoy! Aren’t Supergas the best? I literally got hundreds of miles out of my last pair. You can wash them with icy lean to keep them super white too! This is so gorgeous on you! I absolutely love the maxi skirt! 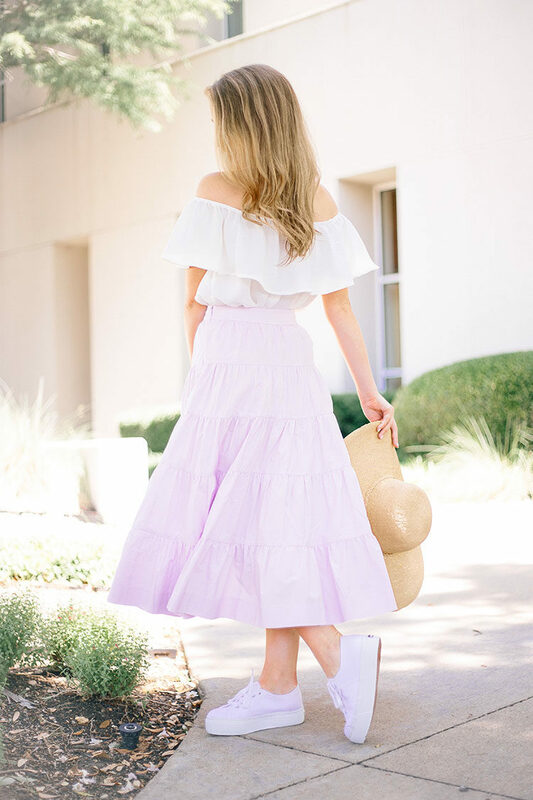 What a beautiful lilac skirt! Color is awesome and makes your outfit perfect for summer! 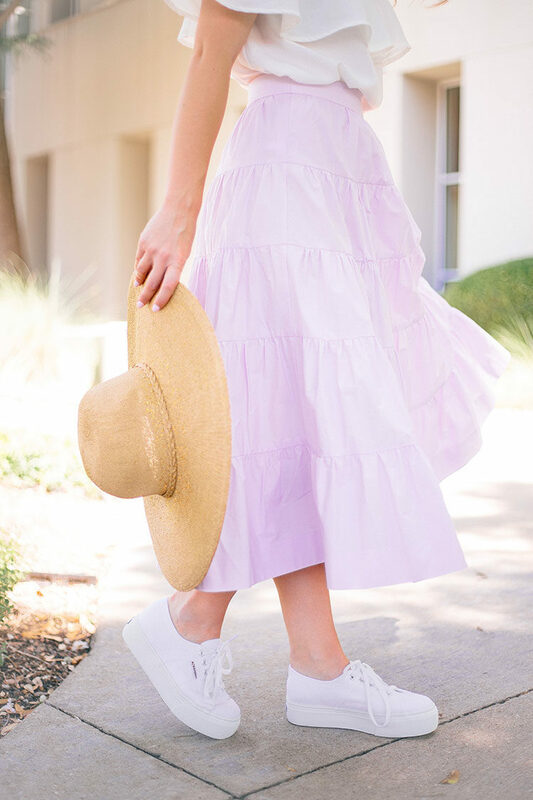 At first, I didn’t like this lovely skirt and this pretty top being paired with these cool sneakers. But actually, they look quite nice paired with this outfit. The hat is as pretty as you are. As usual, your hairstyle and smile are amazing. Fine styling job of yours here! This is such a gorgeous outfit! One of my favorites!